Sarah Vogel, Ph.D. is Director of EDF’s Health Program. It was late September and we were driving up and over the Kebler Pass, which takes you from the dry desert environment of the Western Slope of the Rocky Mountains near Paonia, Colorado to the high mountain town of Crested Butte. We traveled through green meadows up through groves of quaking aspens, bright gold at the higher altitudes, up towards the pass, already covered in snow, blindingly bright under a brilliant Colorado sun and clear blue sky. These were the mountain ranges where Theo Colborn, scientist and environmental health advocate, began her studies; where she lived for much of her life; the mountains that she loved; where she recently passed away at 87 years of remarkable age; and, where I suspect her spirit now resides. As we began to mount the summit, Theo stopped the car, and insisted that we roll down the windows. The air was thin and very cold. We put on our ski caps. She cranked up a Bach violin concerto, and we drove on the summit— the pine-scented smells filling our noses, the wind biting our faces and magnificent violins ringing our ears. This is how she wanted us to drink in the awesome landscape of the Rockies. As we climbed up the pass, she narrated, pointing out the different birds along the way—binoculars at the ready—and citing studies of the quality of the mountain streams, many of them polluted by years of mining. These streams were where Theo began her life as a scientist and where she asked questions about the impact of chemicals in the environment on ecosystems and human health. The questions she asked in these mountains led her ultimately to question whether some chemicals might be having generational effects on multiple species of animals—effects that were resulting from alterations in the endocrine or hormones of these animals and resulting in problems of fertility and behavior. By the late 1990s, driven by Theo’s perseverance and relentless energy, these questions shaped the theory of endocrine disruption, and lay the foundation for the vibrant field of research in environmental health around the world today. As she moved into her late 70s and 80s, her pioneering spirit continued. She spent years developing a massive database of research on critical windows of development—which demonstrated the importance of the timing of exposure to endocrine disrupting chemicals. If exposure to an endocrine disrupting chemicals occurs early in development when biological systems are being laid down—the reproductive system, for example—the impact may appear later in life as systems go awry resulting in problems that range from infertility and cystic ovaries to cancer and miscarriage. Understanding the critical windows of susceptibility changed – or should have changed – the way we study chemicals. If the vulnerable period for development of breast cancer is exposure in the womb, we aren’t asking the right question if we study whether a given chemical exposure that occurred during adulthood is related to an increase in breast cancer, for example. One description you won’t hear is couch potato. Anyone who had the opportunity to spend time with her would have been struck and likely humbled, regardless of their own age, by her boundless energy—even well into her 80s. She found an almost child-like enjoyment in her work that could be contagious. Theo had a wonderful mischievous laugh and a sharp sense of humor. This might be surprising for someone who was driven by her concern that environmental pollution was severely undermining human and ecosystem health. 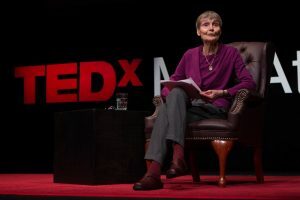 One of her regular talks was a call to arms on the contribution that chemicals in the environment are making to diseases and disorders on the rise globally. The figures and research she presented were a sobering account of diseases and disorders associated with endocrine disrupting chemicals—from behavioral abnormalities and breast cancer to falling sperm counts and male reproductive disorders. Then she came to the final slide, an image of an enormous rock formation in the Rockies that can only be described as phallic. These erect structures she declared were “beacons of hope”—hope for healthy reproduction for generations to come. In one slide and with humor she would show us all what was at stake in the work she did. In those rocks were reminders of the beauty of life and our charge to be safeguards of it while we are here. Theo held the belief that we can and will do better for future generations if we keep asking the hard questions, taking risks, holding onto hope and continuing to laugh. I was grateful to have known and considered Theo a friend. Like hundreds, if not thousands of people around the world, I miss her. The world will be a better place because of her not least because she motivated an army of people to study and advocate for a safer, healthier environment. This entry was posted in Emerging Science, Health Policy, Health Science and tagged bisphenol A, endocrine disruption. Bookmark the permalink. Both comments and trackbacks are currently closed. I was one of the lucky ones whose professional life was touched by Theo: we worked side by side, trying to enact controls on endocrine disrupting chemicals. She endured many attacks from the chemical industry, which tried to destroy her professional reputation just as they had attacked Rachel Carson in her day. Like Carson, Theo was a warrior for science and she was as impervious to their nonsense as she was open to the research findings she worked so hard to put before the public. Theo, your spirit lives on!